Sunday Times's tweet - "Want to know the real reason why Angelo Agrizzi snitched on #GavinWatson? | We have all the details in the #SundayTimesZA tomorrow "
So when it’s Pravin giving testimony against his former colleagues it’s called setting the record straight... But because #Agrizzi is going to implicate ur colleagues it’s now called snitching? 🤷🏽‍♂️ We need a commission on SA media, @AdvBMkhwebane @PublicProtector pls help? Also; didn't Judge Zondo say statements/affivadits shouldn't be published? Why want to jeopardise Zondo commission? Why now, surely @SundayTimesZA was aware of Bosasa shenanigans /corruption but decided to hold on it as it implicate whites. We really don't care, all we care about is the truth from the horse's mouth about how Anc sold out blk ppl! Go Agrizzziiiii! We knew it that you'll find whatever you can to deviate from the real culprit . Always giving us half baked stories as usual. I thought we were doing just fine without SUNDAY TIMES and general media pre emptying Agrizzi. He is giving us for free! and also never forget SUNDAY TIMES that you have no MORAL authority to report on anything. So I will not be buying the SUNDAY TIMES tomorrow!!!!! 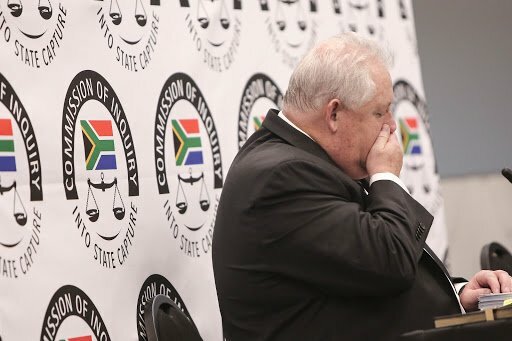 You have been quiet all along, now suddenly you have proof, we don't care, we will wait for Monday, straight from the horses mouth..
Go to hell, Angelo Agrizzi is patriotic. 1. Get-out-of-jail free card (section 204). 2. Witness protection, otherwise he'd be a corpse by Monday. ANC corruptees dont take kindly to be snitched upon. KZN has many bodies on the ground because of such heroes 3. State Capture is the buzz word these days. With your current credibility status? talk about nuts! Snitches get Stitches that's all l know. We don't care about the hows and whys we want facts, just let the bird sing without jeopardizing his case you trash. Frankly we don't care as long as he help us to "connect the dots". We good. Don't distract us please. @Sacro4Sd abusing of public funds for gain instead of supporting our youth to get jobs!! Let me tell you inadvance. You are not going to fool us tomorrow.